Watch our video tutorials to learn about new features, navigating the site, creating student accounts and more! Interactive, engaging, online content, with multimedia, primary sources, lesson plans, teaching methods and tools for differentiated learning. Learn more in less than 3 minutes!. In this video, Instructional Design specialist Laureen Hungo walks through the layout of CICERO, explaining the various sections and how it may be used in the classroom. Student access to CICERO is a licensed feature. In this video, Instructional Design specialist Laureen Hungo explains how to create your student accounts and what information you need to give your students so they can login to CICERO. Browse through some of our most frequently asked questions below. Should you have a question not listed below, please visit our Support button on the left navigation menu. Click the New Account link in the upper right or the FREE TRIAL link from the home page login box to be directed to a form where you can enter your account information. Once you submit the form, you will receive an email with a link to confirm and activate your account. If you are signing up for the free trial, upon clicking the activation link you will be prompted to select one unit to view for your free trial period. 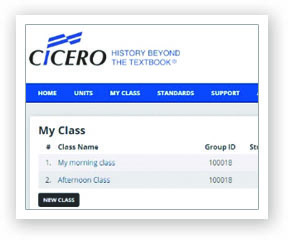 Upon registering for your free CICERO Systems account and clicking on the activation link sent to your email, you will be prompted to select one unit from our 15 units of U.S. History and you will get full access to that unit for two weeks. Is CICERO: History Beyond the Textbook® a free resource? No, CICERO History is a subscription based U.S. History curriculum, complete with narratives, activities, lesson plans, teaching methods, presentations, audio, video and assessments. While parts of the site can be accessed with your free account, much of the content is only available with a paid subscription. 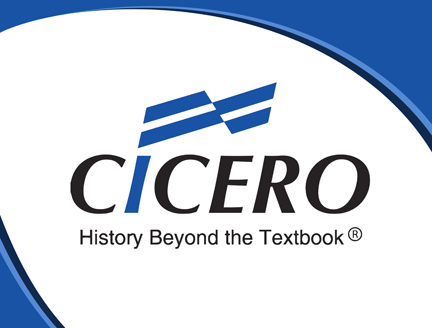 How can I purchase access to CICERO: History Beyond the Textbook®? Please contact one of our Educational Services Representatives for information on purchasing access for individuals or districts by calling 856-241-1990 or via email at sales@cicerosystems.com. Will CICERO work on my system? 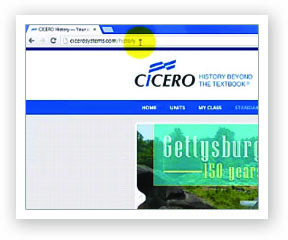 CICERO: History Beyond the Textbook® is a web-based resource and can be accessed anywhere there is Internet access from a web browser, including PCs, MACs, iOS and Android based smartphones and tablet devices. Browser: CICERO currently supports Internet Explorer 8 or higher and current releases of Firefox, Chrome and Safari. PDF Viewer: A PDF viewer is required to open items such as the toolbox which are formatted as PDF files for printing purposes. Presentations: Microsoft Powerpoint or the free Microsoft PowerPoint Viewer is required to open Presentations. You can change or reset your password by using the Forgot Password link from our home page login box or from the login box on the dedicated CICERO Systems login page. Enter the email used when you created your account. You will be sent an email with a link that when clicked will allow you to enter a new password. Click the link and enter your new password in the fields provided. My email address and/or contact info has changed. How do I change it? The account management dashboard is still under development. Until such time as the dashboard is released, please use our FEEDBACK & SUPPORT form to submit a request to change your account information. The account dashboard should be released sometime in the fall of 2013. No audio is heard when playing music or videos. Audio files are played through your local device audio system. Please ensure you can hear audio on your device outside of CICERO. If you can hear audio outside of CICERO but still are unable to play the audio files included, please contact support using the FEEDBACK & SUPPORT form. PowerPoints do not open in the window after they are clicked. PowerPoint presentations are viewable after being downloaded to your local system. You will need either Microsoft PowerPoint to view and edit presentations. Microsoft provides a free PowerPoint Viewer that allows you to view but not edit presentations. Each time I login my other session receives a timeout. How can I login multiple places? Under the terms of service, you are entitled to one simultaneous use per account. While you can login from multiple systems, only the most recent login will be active and previous sessions will be removed.